"The narrator finds himself in the grey limbo of Hell, where the disgruntled and ghostly inhabitants take a bus-ride to the plains of Heaven, where they meet angels and the souls of those already there." While CS Lewis is today first and foremost known for his Chronicles of Narnia series, it was as a specialist in English and philosophy that he made his living, working as a tutor in these subjects at the University of Oxford. In addition, he was a prolific writer for adults of non-fiction (and some fiction, too), with The Great Divorce being just one example. As a piece of fiction, it is arguably more accessible to a wider market than Lewis' philosophical essays, such as The Four Loves. The chapters are very short and for the most part the story proves eminently readable, even if the dialogue in places is not wholly realistic. Lewis is skilled in raising a sense of mystery about where the bus travellers are going exactly, and is able to incorporate an element of magic that is often missing from adult fiction, although some parts are glossed over in favour of the author fast-tracking the reader to his main points, meaning that there is some scope for further development. This includes the at times rather protracted philosophical conversations, which could be clarified. The sense of time and the alternative universe in which they were living or came from prior to the characters boarding the bus is not fully explained or explored either, but in some ways this matters less: the novella's level of mystery is, as mentioned, important, and is partly explained later on, making The Great Divorce worth persevering with. Through his use of metaphor, Lewis effectively encapsulates what humans feel regarding 'justice' and 'injustice', and 'good' and 'bad' people, and takes an interesting look at atheism and how people prepare themselves for death. As the narrator continues on his journey, we see a pattern often followed by children's stories and Christian allegory, whereby only the worthy remain, with Lewis taking elements of the greatest moralistic tales of Dickens, Dahl, Blyton and Bunyan. Unfortunately, the way in which these ideas is presented is concise yet long-winded, short yet confusing. Nonetheless, the writer forces us via his narrative to take a good look at our own flaws, attitudes, and reactions to situations and people. We can be overshadowed by our own personal tragedies and Lewis aims to help us see the futility in this. We need to let them go before we can be happy - and if we go away from The Great Divorce having realised this, then the author has ultimately achieved his aim (in spite of The Great Divorce's disappointing and clichéd ending), making it well worth seeking out the rest of his oeuvre. A full list can be found on Wikipedia. 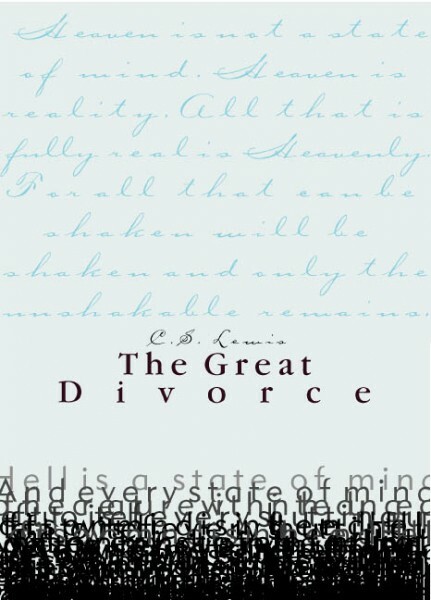 However, The Pilgrim's Regress (1933), The Screwtape Letters (1942), The Four Loves (1960) and Screwtape Proposes A Toast (1961) may prove good starting points.